None of my clothes fit any more! Last fall, I decided I wanted to get more fit. There was no trigger point, no health scare, nothing other than the realization that since I’d started working at home I really could make better use of my lunch hour. So I went to my local gym to sign up, and spent an hour with a trainer. His first question was “what’s your goal”? “I dunno, to be more healthy” was my response. He didn’t like that answer, and after taking me into the gym to prove to me that I was completely out of shape he came back at me with a hard personal training sales pitch that ended with “well y’know mate you’ll never be able to do it on your own”. He had no idea how motivating that statement would be, he had just challenged a cheapskate to save money. Game on! So I set upon a path myself, but everywhere I went I kept coming up against the “what’s your goal” question – websites, apps, workout routines. Fine, I picked a random goal of 250lbs which at the time meant losing a little over forty pounds. Seemed reasonably drastic and difficult, yet attainable. Just having a goal wasn’t going to keep this geek moving though, I needed technology. So I started with a calorie-tracking app called MyFitnessPal, which has pretty much every food known to man available to be tracked against a daily goal of calorie intake. The app gives you a daily goal based on how fast you want to lose weight (I chose 1.5 pounds per week). Eat too many calories in the day, earn those calories back via exercise. My youngest daughter Jaimee had a fun time with that one, and would take me out in the neighbourhood to be my trainer for walk/run/walk intervals while watching the calories tick off on another exercise-tracking app called Endomondo. 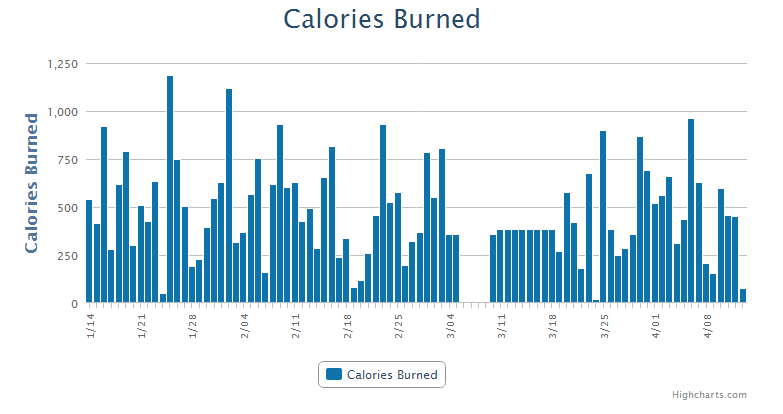 I started to really like the whole calorie in / calorie out thing and gave myself another goal of tracking it for at least a month before I could buy some additional fitness gadgets. I stuck with it, and my reward was the gear that is now part of my daily routine. I still use MyFitnessPal to track calories in, I bought a Fitbit watch to constantly track calories out, and a Fitbit Aria scale to track weight and body fat every morning. Through the magic of the cloud, it all just syncs together in MyFitnessPal so that at any given moment I know where I stand with respect to calories in the day. Yay! The tech only tracks what you’re doing, it doesn’t actually do any of the work for you. Some people have noticed my weight loss and they always ask me what it is that I’ve changed about my lifestyle (getting that question so often is the main reason I’m writing this article, so I’d better answer it). Remove high-calorie items from the everyday diet. That means no sugared pop, no juice, light beer only (cuz who’s kidding who, I’m not giving up beer), milk only with cereal and just water with most meals. Drinks are the “easy” ones to get rid of, but I also stay away from high-calorie snacks in general, replacing with lower-calorie options. I’m now that guy who asks to see the nutritional info before buying or ordering anything. High-calorie items only when I want it enough to put in extra work. Eat less on days when I’m going out for dinner, Extreme Pita as my fast-food kick instead of McDonalds, extra time at the gym if I’m going out for beer and wings. An exercise routine that I try really hard to stick to. It’s booked into my work calendar like any other appointment, and if I need to move it for some reason it gets moved to another day or time. Two visits to the gym per week for weight-training on the machines, and a ninety-minute hike on the weekend while my daughter is at synchronized swimming class. Extra exercise when I have the opportunity, including walks around the neighbourhood. Track it all. I honestly don’t think I would have been successful without getting obsessive about tracking. Yes, I know it’s incredibly annoying especially for my family as I enter things into my iPhone at dinner but it’s been key for me. I noticed after about three months that my clothes weren’t fitting any more. I had dropped two inches on my waistline and the pants wouldn’t stay on. That was a conundrum, because while I needed clothes I was also hoping that I would lose more weight. I bought enough clothes to get my by for a few more months, and boxed up the clothes that were getting way too big. I own two pairs of dress pants and three dress shirts that fit, which gets me by for most work functions for now (although I think my colleagues are starting to notice the limited wardrobe). 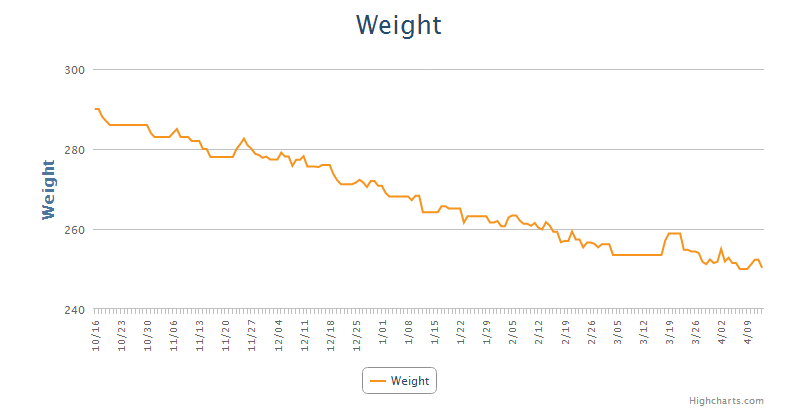 After a few more months, I actually found myself unable to eat as much as I had in the past and staying under the calorie goal became more the norm than the exception. They say your stomach shrinks, I’m guessing that’s what has happened. And to completely bury the lead in the story, this week I hit my 250lb goal and can officially declare my arbitrary goal as having been met. Yay! I’m down almost four inches at the waistline, down a full shirt size, and looking visibly healthier in photos. I’m not done yet though, turns out that arbitrary goal wasn’t quite enough and I still have some more weight to lose before I’ll call it mission accomplished and go wild on a new wardrobe. I’ve tried pretty hard not to talk about it all the time because I know that can be annoying, but I figured this milestone was a fair excuse to share. I’m proud of the work I’ve done so far and look forward to continuing down the path to a healthier lifestyle. I recently updated the smoke alarms in our house. Because I’m me, I did all the research to figure out the most up to date recommendations on type and coverage for the home. 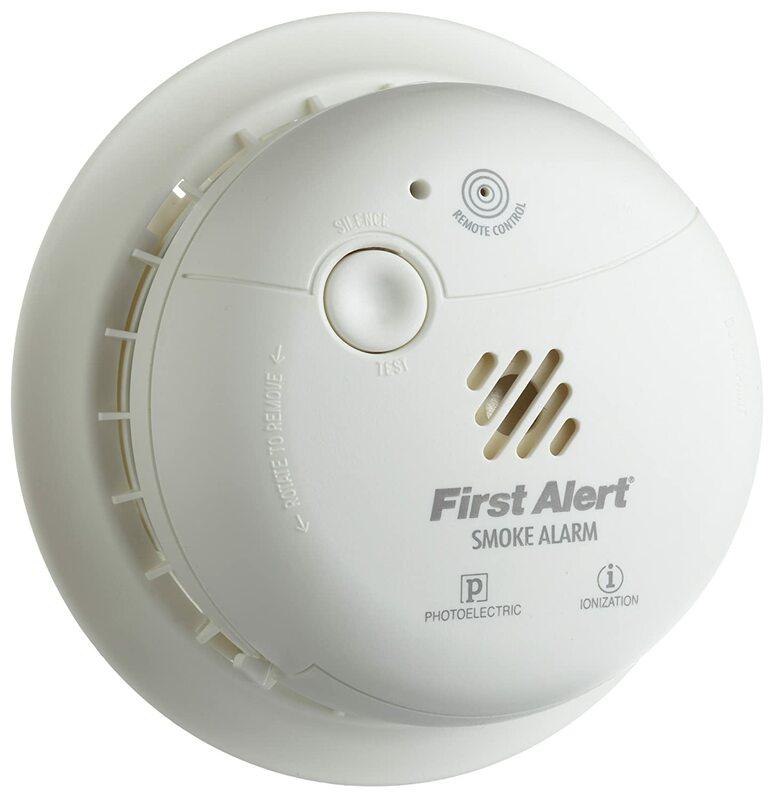 We ended up with several First Alert Dual Sensor smoke alarms throughout the house. These alarms came with a neat feature that allows you to shut off false alarms using any infrared remote control you might have lying around the house. Useful I thought for burnt toast and whatnot. Well the fun began that night, as we were watching TV one of the alarms kept going off. After several false alarms I just took it down and removed the battery, with plans to exchange it. The fun continued a few days later, as the alarm would go off in the laundry room when we turned on the lights. What the heck? This was now too much to be a coincidence, so I hit the internet to do some research. Remember that neat feature that lets you use a remote to turn off false alarms? Turns out it also lets you test the alarm via infrared remote. And you know what else generates infrared signals that can trigger the test function? 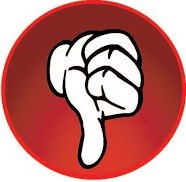 Compact fluorescent light bulbs, yep those twisty CFL bulbs that are by law replacing every light bulb in your house. Legally-required smoke alarms that are incompatible with legally-required light bulbs. That, my friends, is what we call a conundrum. You’ll need to do this every time you replace the batteries, because it will reset back to normal when you pull out the battery. 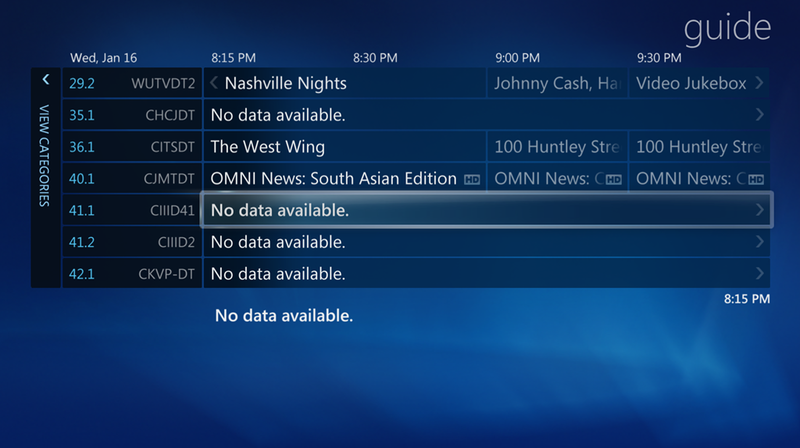 It appears that there is a widespread issue causing certain channels to have no guide data in Windows Media Center. The ball is pretty clearly in Microsoft’s court, but as far as I can tell there are no more players on team Media Center so I expect this one to take a while to fix. Like me, many Canadians set up Media Center using a nearby US zip code to enable all of the high-definition TV features. Unfortunately it seems that the zip code closest to Toronto has been particularly hard hit by this bug. I’ve updated my Media Center hack to help work around this issue by running a single batch file. Full updated instructions and zip file are located at the Windows Experts wiki here. Essentially, this will supplement your buggy US listings with additional listings from Canadian cable and satellite providers. Canadian providers tend to carry lots of US stations as well, so this may also be a decent workaround for some of our friends to the south. Early reports from users at Digital Home Canada indicate that this workaround has been successful for everyone who has implemented it. Finally, I’ve logged the bug with Microsoft (click here). 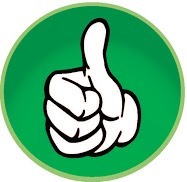 Please vote it up and mark “I can too” stating that you are able to reproduce the bug as well. This might help to speed up the official fix. After a nice deep snowfall, I took the kids out tobogganing yesterday. 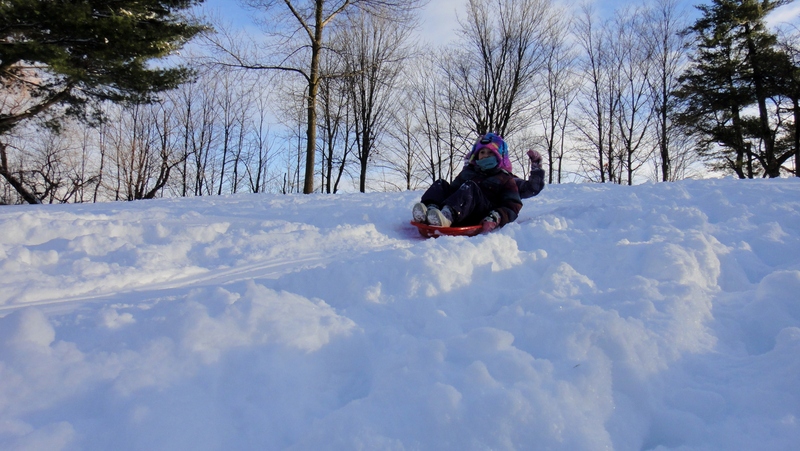 Finding a decent toboggan hill in Milton is a tough mission, but there are a few around. I’ll share our tobogganing spots, and point you to a toboggan hill database where you can both look up some hills or add some of your own. Okay, it’s more *near* Milton than in it but it’s the best hill we’ve got. Steep, an okay size, easy to get to and park. On the down side it tends to be busy and if there’s not much snow, bumpy from all the brush. Watch out for trees near the bottom, although I think they’ve started to put hay bales there now for safety. Near the corner of Laurier and Ontario, there is a park with a decent hill. Mid-grade slope and plenty wide. Parking is available in the Food Basics parking lot. People flock to the hill near Commercial and Laurier, a very wide spot with lots of room for everyone. It is a steep but pretty short slope. People park on the road, but I’d rather see you park at the highschool or in the parking lot of Rad Brothers (near Derry & Ontario). I stumbled across the hill at Livingston Park during a summer cleanup with my daughter’s Girl Guides troop. We went to visit it yesterday, and there was nobody at the hill with pristine powder. It’s not a very steep slope, but a decent size for young kids. Parking is available at the end of Margaret Street. I’ve added all these slopes to TobogganHills.com. Are there any hills you can share?